I like this one because there’s more of a story with the accessories and additional figure. But this horse is more cartoonish than I would like. Don’t know if I’ll color it. I did this one last weekend and I may be done with it. I do love the tiny ship! But the rest is all too close to the edge of the paper (again) and I sort of moved on to other things. But you never know what might show back up here! Is anyone doing Inktober? Another month-long challenge! To draw in ink every day. Thanks for visiting! Grisly Tudor Portrait. My Dark Side! A Last Batch of Mermaids. Probably. This entry was posted in Copic Markers, Progression Photos, sketches, Steampunk on September 27, 2014 by The Beast Tender. I like both of these, Cindy. The second one does look like your own take on a horse tacked out in, is it called mail? Did I spell that correctly? Probably not. Takes me back to the stories I’ve read about knights in armor. Love how you are so – “maybe I will color – maybe not” – If I drew anything half that good I’d color it!! Amazing – as always! Beautiful! I especially love the shadows across the girl’s eye – adds mystery to the story:-) And the ropy haired horse – ingenious!! Like them both, but the house with the ship-LOVE! There’s always room for color. 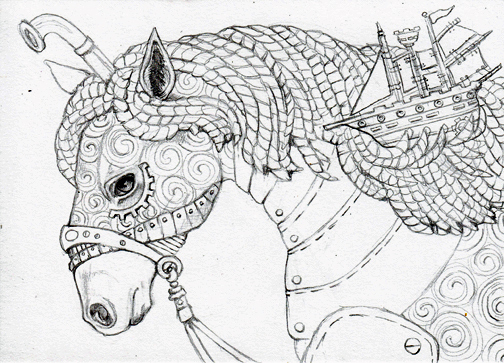 I love the seaworthy pony. 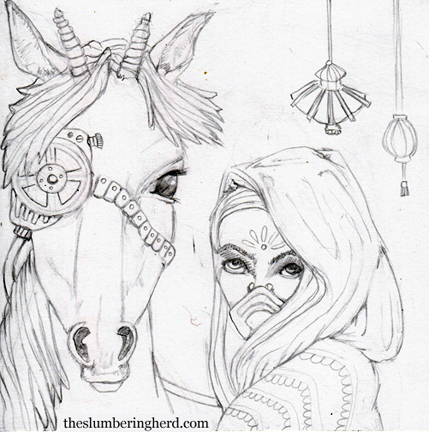 Can’t wait to see the steampunk pony in full color……already beautiful as sketches!